It’s no secret that we at GPF believe Russia, as a global power, is on the decline. And it’s no secret that Russia owes its decline partly to the fall of the price of hydrocarbons, which drive its economy and account for much of its tax revenue. But resources such as oil and natural gas are only one of the three legs that prop up the Russian economy, which would falter without the other two: resource distribution and social spending. The former is structured to prevent the oligarchy from challenging Moscow’s power; the latter is structured to prevent the people from usurping it. The economic framework that underpins Russia has been in place for decades – even during the Cold War. When the Soviet Union collapsed in the early 1990s, money was transferred to the oligarchs in the hopes of maintaining political stability. But instead of reinvesting the money into Russia, the oligarchs sent it abroad, squandering an opportunity to create a long-term capital base for the new economy. For Vladimir Putin, who was elected president in 2000 and would eventually stabilize the country, taking money from the oligarchs meant taking money from his support base. He couldn’t do it lightly, and he couldn’t do it without also considering the needs of Russia’s intelligence agency, the FSB, one of the few institutions that remained coherent during and after the fall of the Soviet Union. Put simply, political considerations complicated what would otherwise have been rational investment decisions. High oil and gas prices bought Russia time, but those prices were unsustainable, and now that they are falling, Russia’s budget deficit is rising. Oil prices are unlikely to rise, given the state of U.S. production, but even if they did it wouldn’t really matter – when oil was $100 per barrel, Russia still failed to create a more mature, diverse and advanced economy. This is because contemporary Russia is structurally similar to the Soviet Union, which fell because the system it supported was paralyzed by political forces that made economic development impossible. In Russia, as in the Soviet Union, a capital base dictated by rational investment decisions can’t really coexist with an economic elite to whom political decision-makers must pay fealty. And so the economy, we believe, will stagnate. It might grow a little, but it will not grow enough to solve Russia’s political problems. Still, we are in the business of constantly challenging our own beliefs. The following report, then, stems from one question: Are our assumptions about Russia’s economy correct, or have we missed anything? Answering this question requires a top-to-bottom review of the Russian economy. After the oil crisis of 1973, the Soviet Union became a global oil exporter, including to Europe. The receipt of oil rents and revenues became an effective way to replenish the state treasury. Oil and gas, moreover, gave Moscow leverage over countries that had come to rely on the Soviet Union for imports. As infrastructure to transport oil and gas from the Soviet Union to Europe was built, the cost to find alternative suppliers reinforced this dependency. But when the Soviet Union collapsed, the economy collapsed with it. The wealth that had not been distributed to the oligarchs lay in its natural resources, making this sector all the more important to the government in the following years. From roughly 2003 to 2014, when oil prices more than doubled, the Russian economy boomed. The revenues generated by these exports enabled Russia to pay off the remaining foreign debt owed by the Soviet Union. They also enabled Moscow to run a budget surplus and allocate resources to social initiatives and national defense. In 2009, Russia saw a surplus of both the federal budget and the current account balance. Things changed in 2014, when oil prices so famously fell. Unsurprisingly, Moscow’s oil and gas revenue fell too, forcing the government to find new ways to generate revenue. Understanding the options available to Russia in that regard requires an understanding of the country’s peculiar budgets. Russia boasts both a consolidated budget and a federal budget. The consolidated budget is a combination of the federal budget, which is controlled by Moscow, and Russia’s regional budgets. The federal budget, which is only one part of the consolidated budget, is developed, approved and spent by the central government. Each budget, both the consolidated and federal, is constituted by tax revenues such as VAT, excises for gasoline, cars, fuel and tax mineral extraction, and non-tax revenues such as fees and payments. Export custom duties go to the federal budget. Personal income taxes, property taxes, resort fees and land taxes are directed to the consolidated budget. Some taxes – for example, corporate income tax – are divided and flow into both budgets. However, all taxes and revenues associated with oil and gas activities are fed into the federal budget and so are also included on the consolidated budget. Two trends are apparent in the federal budget – the one controlled only by Moscow. The first is a decline in tax revenue from oil and gas activities. It fell from 51.3 percent of the budget in 2014 to 36 percent in 2016. The second is a steady increase in non-oil and gas incomes as a percentage of the total budget through the same period. In absolute terms, oil and gas income also fell from 2014 to 2016, and non-oil and gas income has increased steadily since 2009. Since all oil and gas income that flows to the consolidated budget is already captured by the federal budget, income trends in the consolidated budget mirror those in the federal budget. Oil and gas income as a percentage of the total budget declined from 27.8 percent of the consolidated budget in 2014 to 17.2 percent in 2016, and non-oil and gas incomes have increased as a percentage of the budget and in absolute terms. Given the decline in global oil and gas prices, decreased oil and gas revenue was expected. What is surprising is the continued increase, in absolute terms, of non-oil and gas incomes. Had Russia, in the past few years, developed an industrial base capable of offsetting its losses from oil and gas? Different industries’ contributions to the gross domestic product reveal that that is not exactly the case. Though manufacturing has grown in absolute terms over the past decade or so, its contribution to GDP has grown only slightly. In real terms, this suggests that the increase in non-oil and gas incomes is due instead to a more efficient tax collection system. In fact, over the past few years, the Kremlin has implemented a number of tax reforms to do just that. It’s instructive to look at the composition of Russia’s GDP, which has changed only a little in the past 10 years. Manufacturing has the largest share in three of the eight federal districts – the Northwest Federal District, the Volga Federal District and the Siberian Federal District. Though the share of manufactured goods in GDP increased in 2016 compared with 2011, it has not been by much (approximately 0.3 percent). The share of mining as a percentage of GDP is a little over 9 percent. Oil and gas accounts for approximately 8 percent of this 9 percent. The largest component of GDP is wholesale and retail trade and motor vehicle repair. In 2016, manufacturing accounted for about 14 percent of GDP, while mining constituted a little more than 9 percent. Subcategories with the largest increase in contribution to GDP include the share of manufacture of ships, aircraft, spacecraft and other vehicles, which increased from 0.8 percent of GDP in 2011 to 1.4 percent in 2016; chemical production (excluding the production of gunpowder and explosives), which increased from 0.9 percent of GDP in 2011 to 1.2 percent in 2016; and food production, which grew by 66 percent in 2016 compared with 2011, now accounting for 1.8 percent of GDP. Within manufacturing, the biggest contributors were metallurgical producers, food product manufacturers, petroleum product manufacturers, vehicle manufacturers, and materials and chemical producers. From 2006 to 2016, the production of ships, aircraft and spacecraft more than doubled, chemicals production nearly doubled, and metallurgy production grew by roughly 150 percent. The share of metal and machinery production in exports also increased, albeit modestly (1-2 percent). To summarize: Though the composition of taxes has changed fairly substantially over the past five years, the composition of Russia’s GDP has remained fairly constant since 2011. The fundamentals of the economy, then, remain intact. Exports account for approximately 26 percent of Russia’s GDP. Though oil and gas as a percentage of total exports have decreased over the past two years from 70 percent to 47 percent, they are still Russia’s largest export category by far. Despite smaller levels in income generated from its oil and gas industries, Russia continues to increase its production in terms of volume. Adding in other commodities such as iron, steel, aluminum and copper, more than 75 percent of Russia’s total exports are natural resources. The State Duma of the Russian Federation passed a law on the federal budget for 2018 and the planning period of 2019-2020. These budgets anticipate a continuation of the current deficit. It is constructed with the expectation that the price of oil remains at $40 per barrel, which will be subject to an annual indexation of 2 percent starting in 2018. However, the new budget has some differences. First, Moscow expects budget revenues in the next three years to grow in nominal terms but decrease as a percentage of GDP. In 2018, the volume will amount to 15.3 trillion rubles ($262 billion), or 15.7 percent of GDP. In 2020, it will amount to 16.3 trillion rubles, or 14.8 percent of GDP. The new budget therefore reflects an expectation of further declines on the revenue side due to assumed low prices and a substantial cut in expenditures relative to GDP. Second, the budget law also includes the transition to a new budget rule, which implies that the additional oil and gas revenues received from the price of oil above the amount budgeted will be directed not to expenses but to reserves. The reserve fund, which Moscow dips into when it is running short on cash, declined from $140 billion in the beginning of 2008 to about $16 billion in the beginning of 2017. At that time, Russian officials said they expected to exhaust the reserve sometime in 2017. Moscow expects that the main sources of financing the budget deficit will be domestic loans. To summarize: Moscow is attempting to plan around the expected continuation of low oil prices by seeking tax revenues in other sectors. Though non-oil and gas revenue today makes up around 36 percent of the federal budget, oil and gas remains the largest single category of tax revenue for Moscow. However, since other sectors are growing only modestly, there is a limit to the amount of additional taxes that can be levied. Over the past 10 years, consolidated budget revenues from excise taxes quintupled, VAT tripled and social contributions (which includes payments made by employers for medical insurance and pensions) quadrupled. When inflation drives up the prices of goods, the cost, from which VAT is calculated, increases. Indeed, most of the increases in total revenues of the consolidated budget comes not to greater corporate taxes (which might imply the development of more robust industry), but VAT, personal income tax and social contributions – all forms of taxes that suppress consumption and investment. In addition to a breakout by industry, the geographic component of Russia’s economic health can be analyzed by looking at regional contribution to GDP. One notable observation is that, despite the oil and gas that constitutes a large portion of Russia’s GDP and budgets, the composition of regional GDP varies significantly. Resource distribution remains an issue politically in part because of these geographic disparities. The region that generates the most income from tax collections to the budget, the Central Federal District, which is home to Moscow, is not a major oil-producing region. The district, which has a larger population than all other areas, plays a key role in tax revenues. About 30 percent of all taxes come from the central district, which generates more economic productivity from services than resources. Almost half of all the personal income tax collected comes from the Central Federal District. Meanwhile, the central district accounts for 34 percent of Russia’s GDP. The Ural Federal District takes second place. It pays heavy taxes and fees for its natural resources. The Volga Federal District accounts for 15 percent of Russia’s tax revenue due to mineral extraction activities and its excisable goods. Russia’s budget receives a quarter of all taxes on excisable goods from the Northwest Federal District. By comparison, the city of Moscow collects more than twice the amount of tax revenue that the Northwest Federal District does. Right behind Moscow is the Khanty-Mansiysk region, which is located in the Ural Federal District. The majority of tax revenue collected comes either from regions that consume or trade a lot or from regions where resource extraction occurs. Thus, not all districts of the Russian Federation depend on oil. In fact, the extraction of mineral resources is the largest share of regional GDP in only two regions. In the Far Eastern Federal District, the share of mining almost doubled compared with 2004 figures and reached almost a third of regional GDP. Roughly 37 percent of the total regional GDP of the Ural Federal District also goes to the extraction of minerals. The share of mining in the Siberian district has grown from 7 percent in 2004 to 14 percent in 2015. Russia may not be generating as much revenue from oil and gas as it once was, but it is earning more money by taxing its extractive industries. This, however, represents a change in how oil and gas is taxed, not a decreased reliance on taxes generated from oil and gas activities. There is a significant decrease in the share that previously provided large profits – namely, revenues from foreign economic activity and a turn to taxes that are not so dependent on foreign markets but on overall output. The share of oil and gas budget revenue was slightly above 50 percent in 2012 and reached a high of 51.3 percent in 2014. The nominal oil and gas revenues of the budget grew by 1.6 times in 2016 as compared to 2006. The tax on the extraction forms 17 percent of the federal budget revenues, and the revenues from export duties decreased to 7.6 percent in 2016 compared to the 2012 index (nearly a 20 percent change). In the past few years, Russia has been reforming the way it taxes the oil sector. The main medium-term objective of the reform is to reduce the rates of export duty on oil and to raise the rates of the mineral extraction tax. The implementation of this reform, adopted in 2013-14, was called the tax maneuver. The tax maneuver in the oil and gas industry provides for the reduction of export duties on oil to 30 percent in 2017 from 42 percent, with a separate increase in the rate of mineral extraction tax for oil to 919 rubles per ton in 2017 (up from 857 rubles per ton in 2016). As a result of this reform, tax revenues from the mineral extraction tax increased significantly. From January to July 2017, revenues from the mineral extraction tax grew by 44 percent compared to the previous year. Moscow is trying to squeeze whatever it can from its oil and gas industries without further depressing exports, which have already declined significantly in dollar terms because of falling energy prices. Additional taxation is tolerable to the oligarchy to a degree, but Putin knows that they must still be appeased and is therefore constrained from imposing further taxes. The Soviet Union was pushed to its spending limits when U.S. President Ronald Reagan forced it to increase military expenditures to unsustainable levels. Contemporary Russia’s spending on defense is much lower than it was during the late 1980s – at least according to official statistics, which were also underrepresented during the Cold War – but it nevertheless faces tradeoffs. It can increase spending to continue modernizing its military, or it can sustain social programs that keep the public from becoming angry at the central government. Putin is familiar with Russian history – disenchanted oligarchs may have brought down the Soviet Union, but it was mass revolution that ended the czars. There is only so much money to go around, and the details tell a story of a country caught between a set of bad choices, each of which will result in one of the legs of the proverbial stool growing weaker and struggling to support the weight of Russia’s challenges. As a result, Yemenis have become the pawns in the regional power-struggle between Saudi Arabia and Iran. Alarmed by Iran’s spreading influence, the Saudis have begun to speak of the Houthis rather as Israelis refer to the Lebanese militia, Hizbullah: a dangerous Iranian proxy army on their border. Indeed, the Saudis have much to learn from Israel’s experience. Even with the most sophisticated weapons, it is all but impossible to defeat a militia that is well entrenched in a civilian population. The stronger side is blamed for the pain of those civilians. For the weaker lot, survival is victory. The longer the war goes on, the more Saudi Arabia’s Western allies are complicit in its actions. President Donald Trump has given Saudi Arabia carte blanche to act recklessly. He may think it is all part of confronting Iran; or he may want to support the liberalising reforms of the Saudi crown prince, Muhammad bin Salman; or he may hope to profit by selling the Saudis “lots of beautiful military equipment”. Whatever the case, he is damaging America’s interests. Precisely because of the importance of Saudi Arabia—the world’s biggest oil exporter and home to Islam’s two holiest places—the West should urge restraint on the impetuous prince and help disentangle him from an unwinnable war. How? Peace talks led by the UN have begun with the demand that the Houthis surrender. That is unrealistic. Better to freeze the conflict and find another mediator, such as Oman or Kuwait. A deal should involve a phased withdrawal of Houthi fighters from Sana’a and the Saudi border, and the end of the Saudi blockade. Yemen needs an inclusive government, elections and a new structure for the state. Saudi Arabia will need guarantees that Iranian arms are not flowing into Yemen. Then it will have to cough up the cash to rebuild the country. 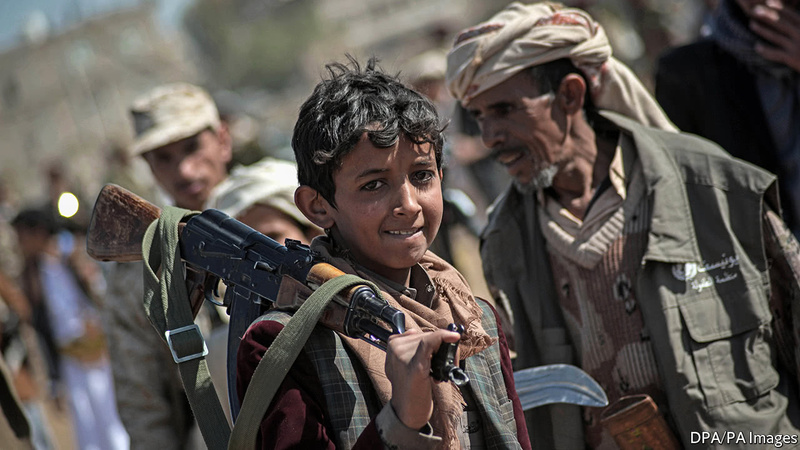 Right now, far from halting the spread of Iran’s influence, the war has deepened the Houthis’ reliance on Iran, which has an easy and cheap means of tormenting the Saudis. And because Saudi Arabia is bogged down in Yemen, Iran has a freer hand to set the terms of a settlement in Syria. The war is a drain on the Saudis at a time of austerity and wrenching economic reforms at home. They should therefore learn another lesson from Israel’s experience of fighting Hizbullah. If wars are to be fought at all, they should be short, and have limited aims. Deterrence is better than debilitating entanglement. Bitcoin traders have no time to pop the champagne anymore. The crypto-rocket shot past $11,000 last week just hours after eclipsing $10,000, which itself was mere days after pushing past $9,000. It then slid sharply before surging yet again. Even as investors celebrate a banner year for stocks, the party next door is so wild there’s no longer any way of ignoring it. Now Wall Street is about to join in the fun. On Friday, the Commodity Futures Trading Commission green-lighted plans by the CME and the Chicago Board Options Exchange to introduce Bitcoin futures, allowing traders to bet on the price of the digital currency on a trusted exchange. Nasdaq is planning to offer its own futures next year, while Cantor Fitzgerald will introduce a Bitcoin options product. Because the futures are cash-settled—traders will receive dollars on the settlement date instead of Bitcoin—the Street technically won’t be getting its hands dirty by buying the stuff directly. But make no mistake: getting listed on some of the largest exchanges in the country is a tectonic shift for Bitcoin, which has been associated with drug dealing and called a “fraud” by the chief executive of the nation’s largest bank. “If it works, you are witnessing the early stages of the birth of a new asset class,” says Bill Miller, the chairman of Miller Value Partners and a longtime value investor who holds about $75 million worth of Bitcoin in his hedge fund. For all of the worries about a reprise of 17th century tulip mania, there are serious financial players who see a future in Bitcoin. 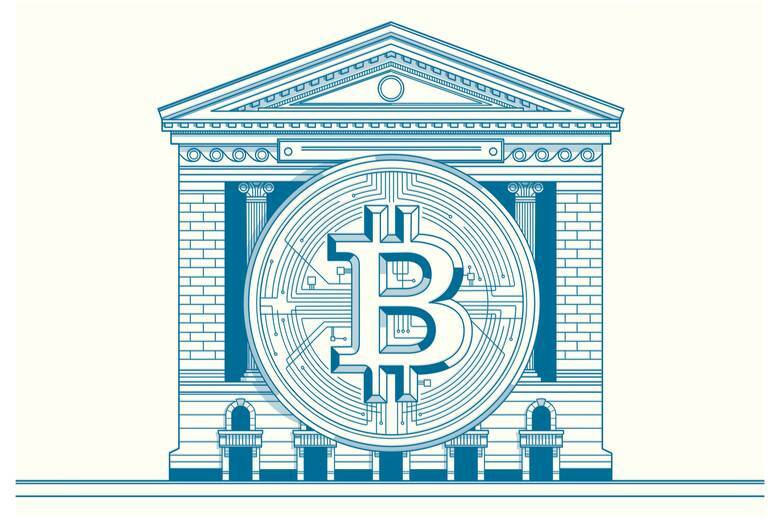 Big banks are cramming to figure out how to get involved, say executives at Bitcoin companies. Their employees are, too. Traders who are paid to make markets in “low-vol products” sometimes have an extra window open on their monitors so they can keep “trading Bitcoin at work,” says Arthur Hayes, who himself leapt from the traditional trading world at Deutsche Bank and Citigroup to start a Bitcoin derivatives exchange called BitMEX. Today’s Bitcoin craze comes exactly 200 years after the formation of the New York Stock Exchange, when a small group of brokers weary of fraud in their industry decided to draft a constitution and set up rules. A formal structure for the equity market took decades to build. The crypto market is trying to build its own structure, without much guidance from the government, in mere months. But the holes, particularly in keeping the assets themselves safe, have created grave risks for prospective investors. New money and talent have already flooded into the crypto market. The cumulative value of cryptocurrencies like Bitcoin has skyrocketed to more than $300 billion from $18 billion at the start of the year. Lawyers, hedge fund traders, and brokers—and even some value investors—have rushed in. Ari Paul, for one, left his job as a portfolio manager at the University of Chicago’s endowment to co-found a cryptocurrency hedge fund called BlockTower Capital this year. But there is a flip side: “extreme volatility, operational risk, security challenges—so it’s not free money,” he adds. Yet Bitcoin has certainly seemed like getting free money this year. Despite some sharp reversals, the price of Bitcoin has mostly been on a one-way ride, rising nearly 1,000% since the start of the year to $10,500 on Friday. Along the way, investors have gotten extra treats. In August, the Bitcoin chain “forked,” splitting off a new cryptocurrency called Bitcoin Cash that was designed as a faster payment system. Most Bitcoin owners automatically got Bitcoin Cash tokens equal to the amount of Bitcoin they had. Bitcoin Cash shot up to $400 on the first day of trading, after not even existing the day before. Coinbase, the largest cryptocurrency exchange in the U.S., surpassed 10 million accounts this year, adding 100,000 new accounts in just three days over Thanksgiving week. (Unofficial counts put the number at more than 13 million, ahead of Charles Schwab accounts, at 10.6 million.) Exchanges and trading houses are reporting soaring institutional volume, too, from five to 10 times last year’s activity. Over the past 50 days, a daily average of more than $1 billion in Bitcoin has been traded globally, according to Chris Burniske, co-author of the book Cryptoassets. The logic that underpins the bull case for Bitcoin often seems circular: It’s worth more because people want it, and the more they want it, the more it’s worth. That’s not unlike traditional fiat currencies such as the dollar. But for other reasons, Bitcoin isn’t particularly useful as a currency. Conducting transactions has become only more difficult and expensive because of gridlock on the network. Visa can process 10,000 times as many transactions per second as Bitcoin’s vaunted blockchain. Bitcoin doesn’t have to be a currency to be valuable, however. Bitcoin bulls tend to argue that it’s more like gold—a store of value that people hold for investment purposes, or for doomsday protection. Like gold, it’s not correlated to most other assets, and there’s a limited supply: Only 21 million will be made. Thomas Lee, the managing partner of Fundstrat Global Advisors, estimates that Bitcoin could account for 5% of the $7.5 trillion alternative-currency market, which is now mostly made up of gold. His 2022 price target is $25,000. Skeptics like Goldman Sachs analyst Michael Hinds note that Bitcoin has several disadvantages compared with gold. Bitcoin is vulnerable to hacking, disruptions to the internet, and competition from other cryptocoins. INVESTORS CAN BUY BITCOIN directly from exchanges designed for retail or institutional investors. Those exchanges will let you trade currency directly from a bank account or credit card for Bitcoin and help you set up a wallet to store the stuff. Trading cash for Bitcoin and vice versa can cost less than 1% of the transaction value. But the exchanges have proved susceptible to hacking. The safest way to store Bitcoin is in “cold storage” on a hard drive that isn’t connected to the internet. Of course, if you lose the hard drive, you lose the Bitcoin. This gap in “custodianship”—a safe way to store Bitcoin and still trade it—is the biggest challenge to getting more institutions involved. Most insurers won’t touch the space. Many accredited investors can’t buy Bitcoin directly because it remains associated with unsavory actors. Bitcoin is regularly used for money laundering, according to the Drug Enforcement Administration. Some exchanges don’t use “know your customer” rules that are common in any other kind of banking or investing. There are no exchange-traded funds available yet, either. Investors could buy a security called the Bitcoin Investment Trust (ticker: GBTC), but it trades at a significant premium to the underlying Bitcoin that it holds, and that premium rises and falls in unpredictable patterns. Large institutional investors have been waiting for products they can buy on the exchanges they already know. “There’s not a day that goes by that a client or a prospect doesn’t bring it up,” said Dominic Marella, the head of business development at Icon Alternatives, a futures broker. Enter the big Chicago exchanges. The introduction of futures products will add liquidity to the system. But the most noticeable impact could be to the downside. “What the exchanges are creating here is a wonderful tool to fully be able to short Bitcoin,” says Mark Williams, a former trading floor executive who now teaches finance at Boston University’s Questrom School of Business. Even if Bitcoin gets Wall Street’s imprimatur, that won’t suddenly make it “safe.” The logistics of trading Bitcoin give it unique risks. Just finding an accurate price can be a challenge, for starters. CME has been working with a London-based company called Crypto Facilities to determine the most accurate Bitcoin price. 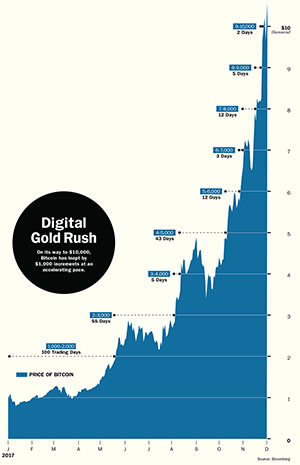 Bitcoin trades on dozens of exchanges around the world, often at considerably different prices. There’s an active arbitrage trade that helps narrow the gaps, but at any given time the price discrepancy can be 1% or more. Crypto Facilities uses four exchanges to create a Bitcoin Reference Rate that will be used as the official price to settle trades. But those exchanges have sometimes proven unreliable. It previously used six exchanges to determine the rate but had to exclude two because they restrict U.S. dollar deposits and can throw the price “out of line,” says Timo Schlaefer, a co-founder of Crypto Facilities. TRADING CASH-SETTLED FUTURES may seem safer than holding Bitcoins, but it introduces its own risks. For one thing, futures trades are settled based on spot prices. “You’re at the whim of the people involved in those spot transactions,” says LedgerX CEO Chou. Among those additional safeguards are margin requirements that will far exceed other products. For now, CME is looking at making traders deposit 35% of their initial investment, compared with 5% for a Standard & Poor’s 500 futures contract. It will also have circuit breakers that will pause trading after swings as small as 7%. New kinds of coins, meanwhile, are increasingly stealing Bitcoin’s thunder. While Bitcoin accounted for 87% of the total market cap of digital tokens at the start of the year, it makes up about 55% now, according to CoinMarketCap.com. A danger is that Bitcoin could end up being the Friendster of the crypto world, while the Facebook—the real winner—may still be in development somewhere. Aside from Bitcoin, the other tokens with a recognizable—though nascent—business case are Ethereum, which can execute more sophisticated operations like contracts, and Ripple, which banks can use to speed money transfers. There are more than 1,200 other tokens too, launched through “initial coin offerings” or ICOs that have drawn increasing capital in recent months. Investors have plunged $3.6 billion into them this year, up from $96 million in all of 2016, according to coinschedule.com. Even people who think that the token economy will one day be as important as the internet itself say it’s a minefield. “Ninety-nine percent of it is junk,” says Olaf Carlson-Wee, the 28-year-old founder of crypto hedge fund Polychain Capital, which has more than $400 million in assets. These coins are similar to Bitcoin in that they are built on blockchain or similar “distributed ledger” technology that is powered by multiple computers. But unlike Bitcoin, which is at least accepted at some businesses and can be traded for fiat currency, most new tokens don’t operate like stand-alone currencies and have little to no usefulness outside of the cloud. They raise money by crowdfunding on dedicated websites, allowing people to trade Bitcoin or Ethereum for the new coins they create. To understand ICOs and the new tokens they spawn, think of the digital “coins” that you can buy (with real money) in some smartphone games. You use those coins to gain access to new levels or weapons. Most new ICO-launched tokens also operate as currencies within self-contained digital worlds. But they promise bigger rewards than a new digital sword to slay a digital dragon. Protocol Labs, for instance, introduced an ICO in August for something called Filecoin. People can use Filecoins to buy cloud-computing storage offered by other people on the network. It raised $257 million, the largest such fund raising ever. Filecoin may be among the 1% that succeeds. But many are almost invariably pipe dreams. More important from a regulatory perspective, they’re essentially securities without the normal protection that securities receive. In other words, people are buying them mostly for their investment potential instead of their potential as crowdfunded projects. There is little stopping ICO creators from taking their $10 million in proceeds and buying a mansion in Hawaii. WITH THAT IN MIND, the Securities and Exchange Commission released guidelines in July on how to distinguish a security, which needs to be registered as such, from a crowdfunded project. Despite the regulator’s report, there remains minimal specific guidance on these products. In the interim, some private players are trying to help investors and entrepreneurs. GDAX, the institutional arm of Coinbase, created a “digital asset framework,” explaining how it will evaluate digital tokens to determine whether they will trade on its platform. Traditional law firms like Debevoise & Plimpton are also getting involved, helping new token creators prepare offerings and guiding exchanges toward legitimacy. New kinds of investment banks are popping up too, often staffed by people whose background is in raising money for more traditional public companies. It can be quite a culture shock. Venture capitalists and hedge funds have warmed to the space, with Union Square Ventures and Andreessen Horowitz giving millions of dollars to investors like Carlson-Wee to invest in new tokens. And some public market participants are making the crossover. Patrick Byrne, the chief executive of Overstock.com (OSTK), is developing a new licensed token-trading platform. Overstock’s stock price has tripled since SEC guidance eased the way in July. Other tokens could soon be available to more investors. Grayscale Investments, which started the Bitcoin Investment Trust, is getting ready to introduce a basket of the largest cryptocurrencies by market value in the coming months. At a CoinDesk conference last week, there was a mix of exuberance and caution. While many attendees may have become millionaires off their Bitcoin stakes, the panelists warned that investors need to know the party could come to an end at any moment. That risk, however, may not be enough to drive interest away from Bitcoin. That argument is getting harder to ignore, particularly as old-school investors get tired of watching the party next door. Bitcoin is among the most volatile investments in the world, sometimes jumping or plunging more than 10% in a single day. Its price can fluctuate based on actions by far-off actors, be they miners in China or coders in California. Still, it’s gaining favor among a group that normally would shun this kind of momentum-fueled craze—value investors. Murray Stahl, 63, is one of them. Stahl has run the New York–based hedge fund Horizon Kinetics for 23 years, investing in more traditional value investments, like beaten-down stocks. Horizon now manages $5.5 billion in assets, including $100 million in Bitcoin. To Stahl, Bitcoin is “the ultimate value investment,” he says. When Stahl started to hold lunches with clients about Bitcoin around 2014, 99% of them hadn’t heard of it and were particularly skeptical. But many had come of age during the rampant inflation of the 1970s and could remember how it destroyed value. “They understand debasement because they experienced it,” he says. Others question whether value investors should be plunging into Bitcoin. David Dietze, president of Point View Wealth Management in Summit, N.J., says he “would steer clear of Bitcoin” and then rattled off a half-dozen reasons: “It’s not backed by any government; it’s not clear that it can’t be hacked; it has no intrinsic value. Sentiment is frenzied; the run-up seems to have no fundamental basis. That chart is scary. This will end in tears.” -- A.S. The Senate Republican tax plan making its way toward a vote today could include a poison pill that worsens a recession somewhere down the road: a so-called trigger that reverses tax cuts or imposes spending cuts if federal revenues come in lower than expected. Though the details of the provision haven’t been laid out, Republican lawmakers have agreed in principle to such a provision as a way to address worries that tax cuts now might lead to revenue losses and deficit increases in the years to come. The trigger would partially reverse some tax cuts if revenues come in below expectations. The problem is what happens in an economic downturn. Revenues tend to go down in a recession because business and household income declines, reducing taxable income. A trigger could impose tax hikes or spending cuts on the economy at a moment when it is already weak, a step that economists say might worsen the next recession. Traditionally, Congress has responded to downturns by doing the opposite — cutting taxes or boosting spending, following the model of British economist John Maynard Keynes, who proposed aggressive government spending to battle the Great Depression. “No recession is on the horizon, but another recession hitting while a trigger was in place would create enormous problems,” J.D. Foster, chief economist at the U.S. Chamber of Commerce, wrote in a blog post. If the trigger is activated when the next recession hits, that would raise taxes “and therefore acts as a further drag on GDP growth just as the economy is going south,” said Ernie Tedeschi, an economist at Evercore ISI, an investment research firm, who previously worked in the Treasury Department during the Obama administration. Economists call such a policy “pro-cyclical,” meaning it exaggerates the ups and downs of a business cycle, adding fuel to growth when times are good and taking away the fuel when times are bad. It would be similar to what many states, facing requirements to balance their budgets, have to do during downturns. 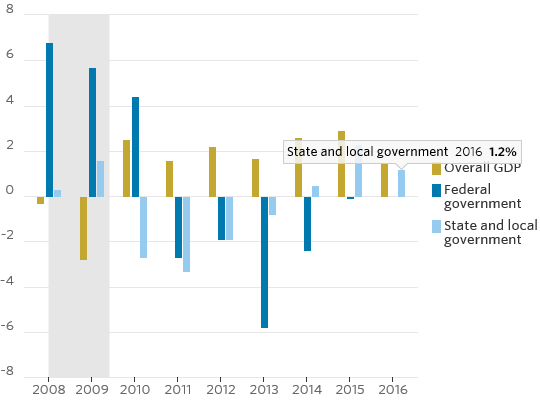 State and local government spending contracted for four straight years between 2010 and 2013 – the longest run of cuts in the post-World War II era — slowing the national economic recovery and aggravating an already tepid expansion. “They had big revenue shortfalls coming from the recession and then they had to fire state workers, cut spending, raise taxes—all the kinds of things that make no sense in a recession,” said Alan Auerbach, a professor of economics and law at the University of California at Berkeley. The federal government doesn’t have such a requirement. Imposing one “would be really unfortunate,” Mr. Auberach said. Other types of automatic triggers have been used before to smooth the passage of major fiscal legislation, with mixed effects on the economy and budgets. In 2011 the Obama administration and Republican leaders in Congress agreed to a series of automatic spending curbs to address worries about larger deficits that followed the financial crisis. One package of such cuts, known as sequestration, would kick in only if a bipartisan committee did not agree on a plan to reduce deficits. Congress failed to agree on a deficit-reducing package, and the across-the-board cuts eventually took hold in 2013, slowing the expansion, but also holding down deficits. Federal spending contracted for five straight years between 2011 and 2015. Deficits as a percent of gross domestic product shrank from 8.5% in 2011 to 2.4% in 2015. Senate Republicans haven’t specified how their trigger would work and the design could have big implications. Mr. Tedeschi said Congress could mitigate the problem known as “pro cyclicality” by basing the trigger on longer-run changes in government revenues that aren’t set off by short-term economic swings. 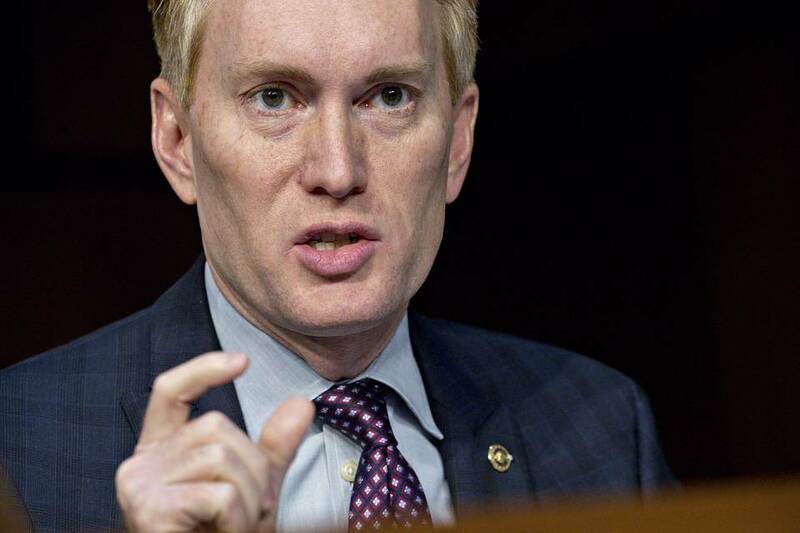 Sen. James Lankford (R., Okla.), a proponent of the trigger, said lawmakers would design it so they can turn it off during a recession. Attempts to control for the business cycle would be difficult, Mr. Auerbach said, because policy makers would not necessarily know how deep a recession might be or how long it would last, given that such information comes with a lag and is often revised. Often the economy is in a recession for several months before one is even officially declared. For instance, the U.S. economy last fell into a recession in December 2007, which researchers officially announced in December 2008. Republicans project that tax cuts will spur economic growth and help to boost federal revenue even as tax rates come down. These debt sustainability worries exist in part because past tax cuts haven’t always lived up to expectations of higher revenues, forcing legislatures to reverse them later. Congress forced President Ronald Reagan in 1982 to repeal some of the 1981 tax cuts, and Kansas recently undid its business-tax cuts after they led to big revenue losses.